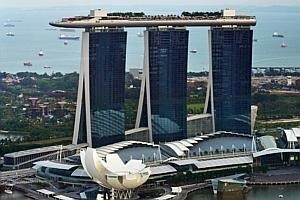 The bulk of Marina Bay Sands' 9,000-plus employees may join a union, but not for the reason workers traditonally do. The integrated resort operator and the union yesterday inked a memorandum of understanding (MOU). and agreed that collective wage bargaining was not their goal. The objective of the MOU, which paves the way for union membership, is to boost the welfare and well-being of workers, said MBS and the Attractions, Resorts and Entertainment Union (AREU) in a joint media release. MBS will pay the union membership fees as a perk for staff under the MOU. "The partnership between Marina Bay Sands and AREU will enhance the social and recreational benefits of Marina Bay Sands employees and create an additional platform to forward constructive labour-management relations," the media release said. The signing ceremony yesterday, held on the sidelines of the National Trades Union Congress' Ordinary Delegates Conference, was witnessed by labour movement chief Lim Swee Say. The MOU will see both sides "working together in a consultative and progressive partnership". Up to 7,500 rank-and- file, professional and security employees of MBS will be eligible for general branch union membership. A managed general branch (MGB) committee will be formed by eligible employees under the AREU, which is affiliated to the NTUC. The MGB committee will discuss issues relevant to employees, such as additional training and skills upgrading to help continually boost productivity and raise service levels. "It will also be an additional channel to facilitate interactions between employees and management on workplace issues," said MBS and AREU. Like other NTUC members, MBS staff will also enjoy benefits such as NTUC FairPrice cash rebates, free group insurance coverage, grants for training and discounts on movie tickets, in addition to staff perks offered by the integrated resort's Sands Exclusives programme. The latter includes property-wide discounts, free exercise and culinary lessons, as well as travel, lifestyle, fitness, digital and banking deals. "Our partnership with AREU is another step towards being an employer of choice as we anchor our roots in Singapore," said MBS president and chief executive George Tanasijevich. "More importantly, it is a reflection of our ongoing efforts to create and deepen meaningful community partnerships which will result in more social and recreational benefits to our team members, beyond what they currently enjoy at the company level." AREU president Hassan Abdullah added: "For the labour movement, we are happy to be given the opportunity to be a trusted voice for the workers at the workplace."